of FalCon QuickView – even in the viewing part. FalCon CustomerView makes presentations of AVIs, pictures and measurement graphs as easy as child’s play. The five data areas of a test file – films, measurement data, pictures, documents and layout – can be filled in via drag-and-drop. You can create various groupings within the individual areas – similar to a directory tree – except that in this case you also have the additional possibility of assigning descriptions to the groups or entries. For example, to show the location on the object where a measurement channel was recorded, you can insert icons in overview pictures that can be freely defined. Of course this works in reverse as well: clicking on a symbol within the picture immediately causes the corresponding entry to be selected within the tree view. All associated data of a complete test or a series of tests can thus be combined together to provide an overview, or can be archived. 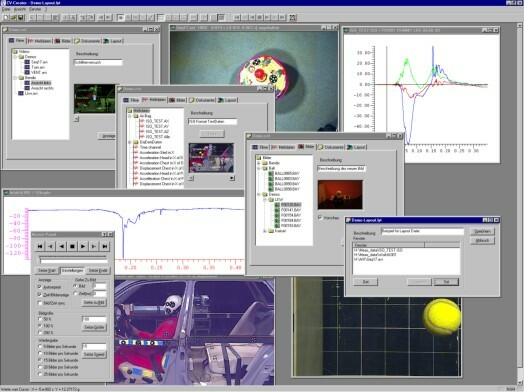 CustomerView has display modules for AVIs, all commonly used picture formats (including the original formats of the camera manufacturers NAC, Redlake, Photo-Sonics und Weinberger) as well as the most important measurement data formats (including DIAdem, ISO-Crash and others). Single pictures can be edited as in the FalCon QuickView module. Almost everything can be included under the "Documents" tab: text files, Excel spreadsheets, databases and even independent programs. Double-clicking on a document starts the corresponding program (the one associated with it through the Windows registry). The layout files are an especially important feature: they determine the way in which the screen is divided up, for example at the top left an AVI positioned on picture 23 at normal size; at the top right an enlarged view of a JPEG picture; at the lower left a small window with a measurement graph; and at the lower right a large window with several measurement graphs. After this, you simply create a new layout, save the screen distribution setup and you’re done! To bring back the same arrangement later on, simply double-click on the layout file. It’s that easy to create presentations and to highlight important details in the results! An additional feature is integrated for service providers: simply clicking with the mouse will create a "customer version". This also assigns a directory in which all data will be copied based on a specified directory structure, no matter where the original data comes from. The CustomerView also makes certain that files with the same name are not overwritten, and that files used multiple times are only copied once. An installation director is created automatically. A special viewing version of the program can be installed on the customer computer with it. Now just burn the entire directory onto a CD – and that’s it. With the CV Creator Full Version you create new test or layout files and compile a customer CD. The CV Viewer Customer Version may be distributed without any limitation or license fee. It contains all the viewing options listed above, but it does not permit – in contrast to the CV Creator full version – changing the documents or data structures.